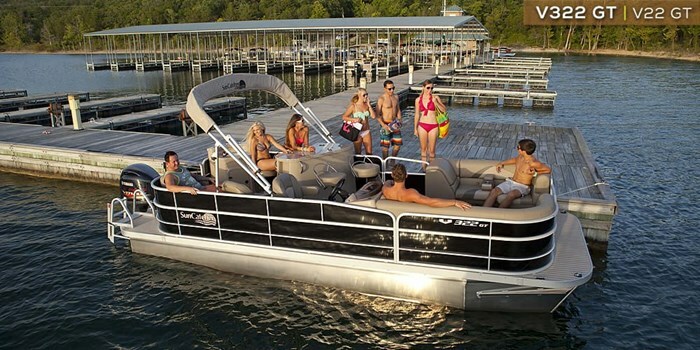 SunCatcher, the pontoon boat division of G3 Boats of Lebanon, Missouri, a Yamaha Marine Company, offers twenty-eight floorplan model configurations in three series of two-log pontoon boats in 2015 ranging from sixteen to twenty-six feet. Actually, there are forty-two model nomenclatures listed by SunCatcher but the fourteen additional models are designated with the number “3” in the nomenclature indicating the addition of a third log with essentially the same floorplan. So the V22 GT, subject of this review, is a two-log model whereas the V322 GT has the same floorplan but with a third log added along with increased capacity and horsepower ratings plus some additional standard equipment. 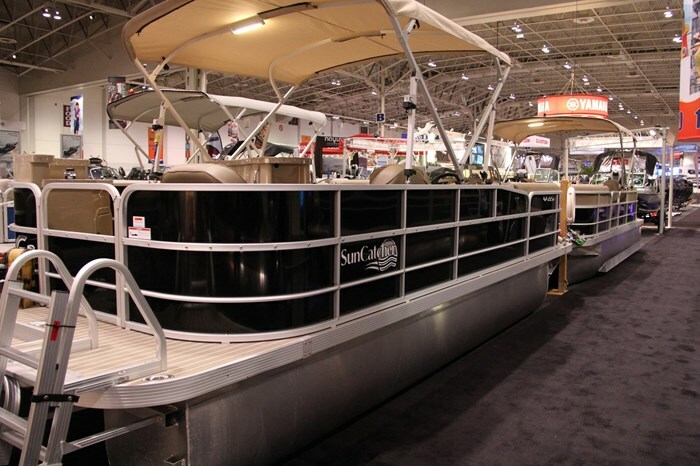 The “V” in the model designation indicates that this boat is part of SunCatcher’s V series lineup of thirteen models from sixteen to twenty-two feet. Six of these thirteen models are available with a third log thus increasing the V series model availability to nineteen. The “GT” designation in the model name indicates SunCatcher’s “Grand Touring” floorplan configuration, a designation which is unique and oh so appropriate. Let’s explore it. Probably the first most noticeable and indeed the most prominent eye catching feature when boarding the V22 GT is the entertainment centre occupying the aft half of the entire port side of the boat. Its seductively curved and contoured features include built-in cupholders in the solid countertop, small item storage within, and it comes complete with four low back, well padded, adjustable swivel bar-type stools in fixed floor bases. A food preparation area located in the stern portside corner and complete with additional built-in cupholders plus a sink with more storage below forms part of this entertainment centre. Opposite this on the starboard side is another unique GT feature. In place of what normally might be a lounge seat are two adjustable lounge chairs with armrests and with an available drop-in storage tray with more built-in cupholders. 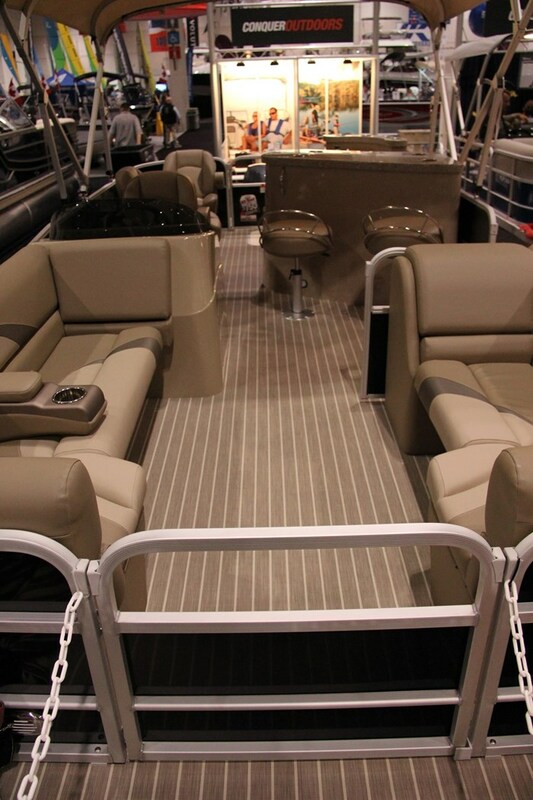 Of course, just ahead of these two lounge chairs is the adjustable and swivel captain’s helm chair thus placing a total of three of these chairs on the starboard side facing the entertainment centre on the portside and creating a complete gathering place with individual, adjustable seating for seven persons within the aft half of the boat. The starboard side driver’s molded helm console features a semi-circular array with standard large speedometer and tachometer flanking a centre mounted smaller diameter fuel gauge. To the left of centre are the DC rocker switches, and to the right, the standard Alpine® stereo receiver with Bluetooth®, iPod®, MP3, and USB compatibility. A 12-volt accessory outlet is also included. The large and relatively horizontal surface between the curved instrument cluster and the steering wheel offers a built-in cupholder for the driver plus an ideal temporary storage spot for sunglasses, hat, keys, etc. 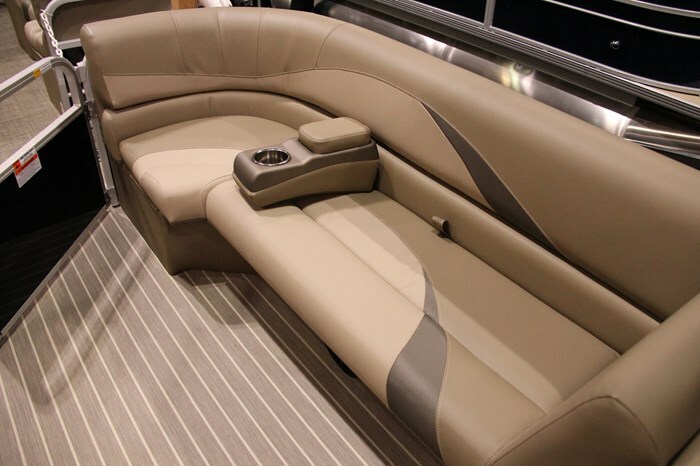 The bow section of the V22 GT features the more standard furniture of facing contoured wrap around lounging couches with movable armrests and full storage below; a two seater lounge on the port ahead of the portside gate and a three seater lounge on the starboard side ahead of the helm. A bow centre gate separates these two lounges. These lounges are of Roto molded construction with rain drain channels under the cushions to keep stored items dry. The centred stern gate leads to a full-width stern water access platform complete with standard 4-step folding boarding ladder. 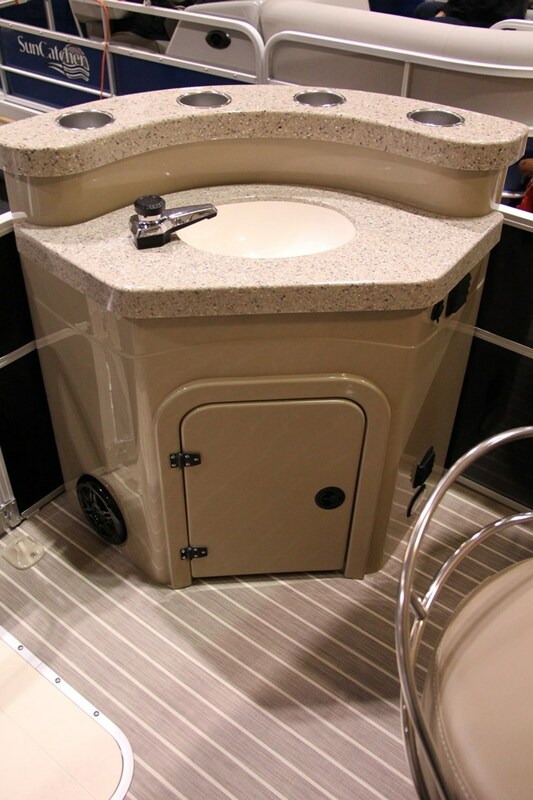 Standard equipment also includes a bimini top with boot along with a mooring cover. Depending on the type of boating you plan to do, you can choose Yamaha outboard power from 40 right up to the maximum 115 horsepower rating to satisfy almost any waterborne needs. 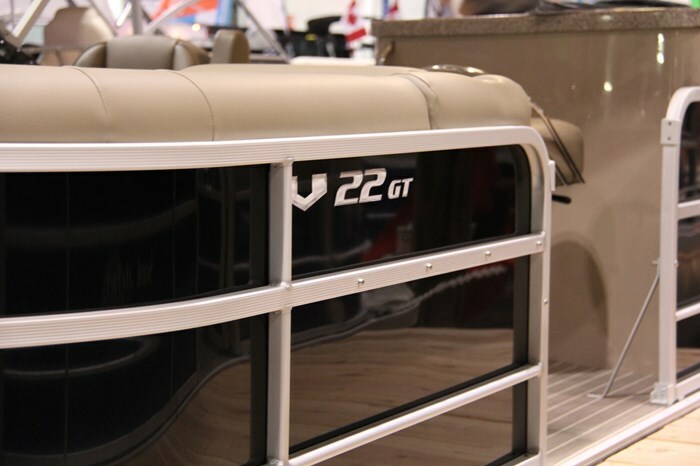 Notable factory optional accessories available for the V22 GT include a below deck performance shield, lifting strakes for the standard 23” x 25” U-shaped, closed-cell, foam flotation filled pontoon logs, plus Sea Star® hydraulic steering. These three options would be most beneficial if you are opting for the higher horsepower. Other options include a powder coated or galvanized tandem axle trailer with available upgrades, several choices of Garmin® echo™ GPS/fishfinders, bow couch insert to create full U-shaped wrap around bow lounging, pop-up change room, ski tow bar, refreshment centre with cooler, snap-in carpet, plus of course several canvas covering options up to a full camper enclosure. Choose from three standard exterior fence colours; red, black, or blue.